Nebraska born actor Henry Fonda was 14 years old when this incident occured. He watched the riot from the second floor window of his father's printing plant across the street from the courthouse. "It was the most horrendous sight I'd ever seen . . We locked the lan, went downstairs, and drove home in silence. My hands were wet and there were tears in my eyes. All I could thimk of was that young black man dangling at the end of a rope." 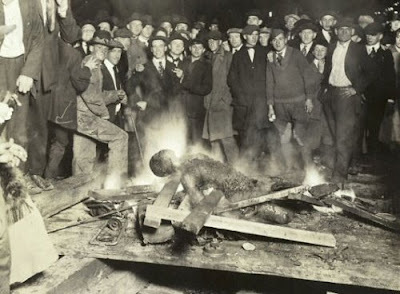 I got interested in lynching because of my interest in African American visual culture. It seemed to me that it was necessary to add certain previously ignored elements to the aesthetic ensemble in order to more plainly see the traditions of an African American visual culture. When I decided to do a Ph.D., my first impulse was to do it in Art History but after very little research I realized that it would be entirely an uphill battle to do extensive coursework in Art History, most or all of it having nothing to do with African American visual culture, and then compose a committee from the current personnel of the best departments of Art History. Your committee is just as important or even more so than the available coursework when it comes to completing the dissertation. As I imagined it, the better field to pursue would be film because it meant that I would be studying the 20th century, a period during which I thought the impact and visibility of African Americans was undeniable. My tropes were passing, lynching and Jim Crow, which I borrowed from the concerns so prominent in the African American literature of the 20th century. It is a truly wonderful and indispensable book with selections of writings on lynching by Frederick Douglas, Frances Harper, Ida B. Wells, Pauline Hopkins, WEB Du Bois, James Weldon Johnson, Charles Chesnutt, Theodore Dreiser, Carl Sandburg, Jean Toomer, Langston Hughes, Walter White, Sterling Brown, Nancy Cunard, Claude McKay, Erskine Caldwell, Richard Wright, Countee Cullen, Esther Popel, Angelina Weld Grimke. Anne has written for this book a wonderful, lucid, crystal clear and succinct introduction to the issues of lynching in American culture, as well as shorter introductions to each writer, and to each essay, short story, play or poem included in the book, weaving all the material in the book together into a perfect correspondence with the actual events of the period. Since 2000, I have had several copies of this book in my possession but I always end up giving them away to people I think may really need to read it and who won't go to the store and buy it for themselves. During my recent visit to the Schomburg, I found a copy of it in the gift shop for a price of $7. The proprietor of the store told me that the book was out-of -print and had been remaindered, which explains why the book was so inexpensive. Anne's purpose in doing this book was to make available in one place a range of relatively obscure writings on lynching, most of which I had never seen before. These were the historical witnesses to lynching, able to articulate for their audiences then exactly what they thought they saw along with its deeper meaning. And yet so few people have ever had a chance to read this proud American literature. Fewer still will have the chance with the passing of this book, an obscure title during the best of times, from availability. Just this past Wednesday, Judith Killens, a former M.A. student at the Graduate Center, a teacher and an intellectual, was saying during a visit to my office at CCNY (NAC 6/223) that it was getting more and more difficult to explain to students why they needed to go to libraries and do research in an archive since more and more everything can be found online. She was pointing out in particular a booklet that Ida B. Wells, her husband and Frederick Douglas had produced at the Columbian Exposition in Chicago in 1893 with the title WHY ARE THERE NO BLACKS AT THE COLUMBIAN EXPOSITION which is now online in its entirety. But I still worry about what will happen to WITNESSING LYNCHING. I still worry that first, having something online doesn't make it necessarily more available to the people who need it and 2) that some projects are inherently against the grain and are therefore invisible to the majority of the reading and thinking public. Another project which is also probably indispensable in its importance is REMEMBERING JIM CROW: AFRICAN AMERICANS TELL ABOUT LIFE IN THE SEGREGATED SOUTH edited by William H. Chafe et al, The New Press and Lyndhurst Books of the Center for Documentary Studies at Duke University Press, 2001, which contains two hours of interviews as well as a book of analysis and a transcript of the recordings, bibliography, etcetera and so forth. This project was in part inspired by the previous REMEMBERING SLAVERY project edited by Ira Berlin and others, and coordinated by Joe Wood, an editor and writer greatly loved and admired by myself and many others. I became Anne's mentor and the head of her dissertation committee. She subsequently wrote her dissertation on lynching and literature, completing her graduate work at the Graduate Center in 2004. She currently teaches African American Studies at Lehman College, CUNY, and is working on a book on lynching, photography and historical memory. ***There are inexpensive copies of WITNESSING SLAVERY at the Schomburg Gift Shop. Also, they have piles of A SMALL NATION OF PEOPLE: WEB DU BOIS AND AFRICAN AMERICAN PORTRAITS OF PROGRESS, The Library of Congress with Essays by David Levering Lewis & Deborah Willis, 2003--African American Photographs Assembled by Du Bois for the 1900 Paris Exposition--at half price!!! !